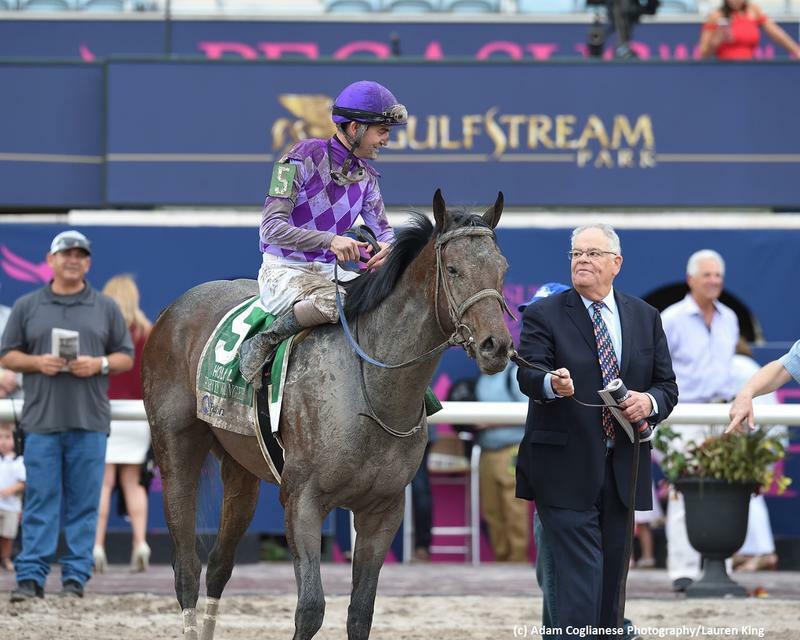 Harold Lerner LLC, AWC Stables, Nehoc Stables, Scott K. Akman and Paul Braverman’s Harvey Wallbanger powered home along the rail in posting a last-to-first triumph in the $350,000 Holy Bull Stakes (G2) at Gulfstream Park on February 2. The Ken McPeek trainee completed 1 1/16 miles on the dirt in 1:43.69 en route to a one-length tally under the guidance of Brian Hernandez Jr. Harvey Wallbanger earned 10 points on the Road to the Kentucky Derby following his first stakes score. The Kentucky-bred debuted at Saratoga last summer in a six-furlong dash. He ran into a really good one on that day in Complexity, who would return and crush his foes in the Champagne Stakes (G1), but Harvey Wallbanger was a clear second in a fine first offering. He stretched out to two turns at Keeneland second time out and fell a nose short of victory, just missing to Plus Que Parfait, who came back to finish a big second in the Kentucky Jockey Club Stakes (G2) at Churchill Downs. Harvey Wallbanger finished second once again in his next try before finally breaking through in November with a late-running win beneath the Twin Spires. Harvey Wallbanger posted a lifetime-best 95 BRIS Speed figure in the Holy Bull, with an accompanying 100 Late Pace number. The 14-point boost off of his maiden win makes the colt a tricky read to me. He could be on the rise at the right time of year or might have capitalized on a ground-saving voyage while running down some tired foes whom lacked his foundation. Bred in the Bluegrass State, the son of Congrats was a $50,000 purchase at the 2017 Fasig-Tipton Kentucky July Yearling Sale. He is the first graduate out of the Distorted Humor mare Adorabell, who counts herself as a half-sister to stakes winners Wild Deputy and Deb’s Honor. The female side of this family, on a whole, tends to slant towards miler types with the ability to prosper on both turf and dirt. Harvey Wallbanger does his best when taking back and making one run in the stretch to this point. He doesn’t appear to be fast enough to compete with the top in his division at this juncture, and I also have concern about his ability to be as good going 1 1/4 miles later this season. The next race will tell me a whole lot about where the colt stacks up with his fellow three-year-olds.